MacKenzie Warren, PhD, has been selected as a recipient of the 2016 Shaheen Award. About the award: The highest honor bestowed on Notre Dame graduate students, the The Eli J. and Helen Shaheen Awards were established in 1990 and are named for two long-time benefactors of the University. They recognize the superior academic achievements of a graduating student in each of the four divisions of the Graduate School—Engineering, the Humanities, Science, and the Social Sciences. Nominated by their departments, Shaheen Award winners are chosen for their superior ability as exhibited by grades, research, and publication records, fellowships, and other awards received during the course of study at Notre Dame, as well as teaching ability. Dr. Warren’s research involved the development of novel neutrino and nuclear physics mechanisms to generate successful supernova explosions, and thus how the heavy elements made in stars are ultimately distributed throughout the Galaxy. He took a new approach to generating successful supernova explosions in theoretical models by studying the impact of neutrino “oscillations” (transformations) in core-collapse supernovae—in particular the transformation of standard neutrinos into a proposed fourth neutrino flavor: a right-handed, “sterile” neutrino. Warren has shown that such oscillations can generate successful supernova explosions, even in models that would not otherwise explode. This has created a new paradigm for understanding the explosion mechanism of core-collapse supernovae, which are ultimately responsible for most of the carbon and oxygen found in the Universe. While at Notre Dame, Warren served as a graduate teaching assistant for four years and completed the Physics Teaching Practicum, which involved planning and delivering three lectures under the guidance of the Kaneb Center and faculty mentors. Outside of the academic environment, he engaged in public outreach and education with the Popscope astronomy outreach program. Popscope is an urban astronomy outreach movement that aims to increase civic engagement, reconnect communities, and increase public interest in science by hosting free astronomy nights in public spaces. Warren’s role in this has been to provide technical and professional support to the chapters. Warren is also committed to promoting equality and inclusion in STEM fields and higher education, with the goal of ensuring equal access in STEM for members of marginalized groups such as women and members of the LGBTQ community. He was active in the Graduate Student Union at Notre Dame, the Association for Women in Science, and attended the inaugural Inclusive Astronomy Conference in 2015. 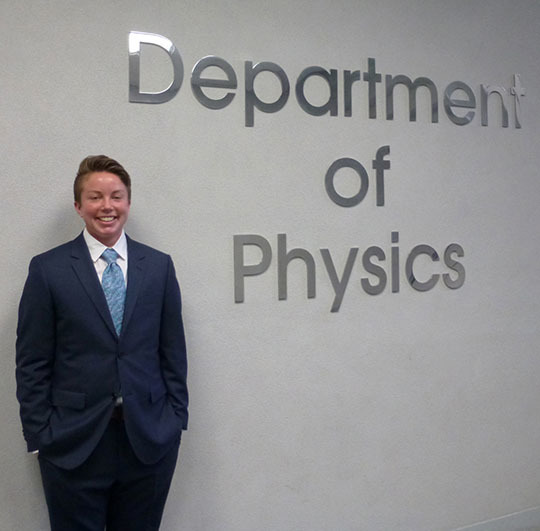 After receiving several offers, Dr. Warren has accepted a position as a postdoctoral researcher at Michigan State University, where he plans to continue modeling core-collapse supernovae. Originally published by Shelly Goethals at physics.nd.edu on May 04, 2016.